I've been keeping something from you all. For about a month now. I found a new "holy grail" product and it's officially legit. Kiss My Face Upper Management gel mixed with castor oil. It makes my hair "silky". You get me? SILKY hair. What? I know. Like, not frizzy, smooth shiny moist curls for days. When I first got this gel I hated it! It seemed drying and flaky and got crunchy. I used a lot, I used a little. I had ordered a 3 pack from Amazon and I even gave one away. Then one day a few weeks ago I got a glimmer of a silky curl on day 3 of a mediocre wash and go. I re-evaluated the way I had been using it and adjusted my next application. 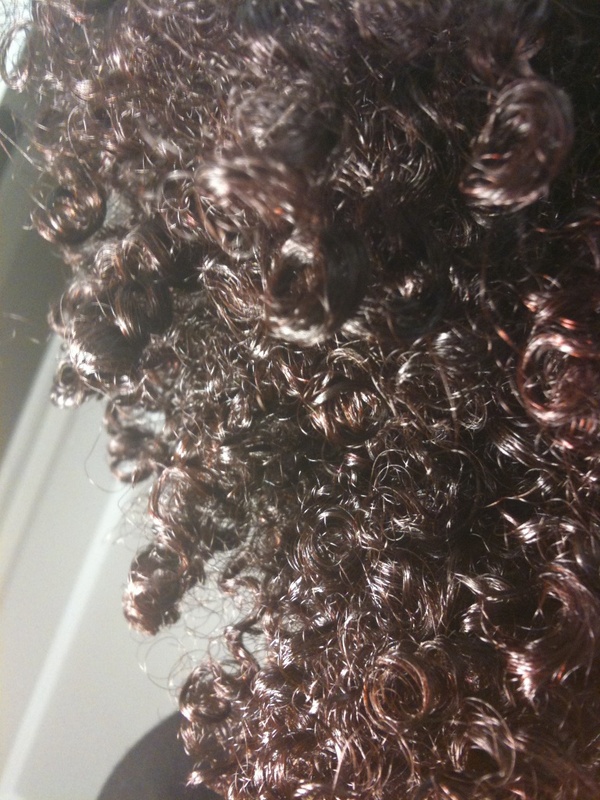 I added castor oil before I applied it- mixed the two directly together. BAM! silky hair. For a wash and go, perfect touchable curls. I have yet to try it on a twist out or set, and I don't know if the whole "silk" factor will work there... but I am curious and I will keep you posted. *Certified Organic by Quality Assurance International. Cheapest I found it- $4.99 at Vitacost.com for 8oz. I just found out I'm allergic to coconut oil. I was getting a reaction like you. Then my doctor referred me to an allergist and he gave me a list of things I'm allergic to. It's long! But that's what was causing a lot of problems. Now I have to be very careful about the ingredients. I've found that when I combine my amla oil and gel, it doesn't flake. I will be trying the castor oil too. I just found your blog a couple of weeks ago and I love it and your hair. My hair is ALWAYS frizzy...so much so that I rarely wear it out now. I'm frustrated but willing to try whatever I can to help tame these curls. Thanks for sharing your secret! I think I'll try that combo. Just one question...how would you describe the smell of the gel? I prefer mild scents. Thanks again! I bought it yesterday! Oh wow, it's good. Thanks so much for sharing. I got the last bottle from the store but hopefully they'll have more soon then I can stack my cupboards. I love KMF Gel. I use it on top of my leave in conditioner for braid outs and flat twist outs. My hair gets so sheeny, extra-defined and extra-soft while using it. Jamaican Black Castor Oil gives my hair the same effect. I have been following this blog for about a year or so now and I always find your reviews and tips to be working great on my hair. In this youtube video, you mentionned having had problems with acne, which caught my attention because lately I have been trying EVERYTHING to fight my new acneic skin...:( You see I never really had any acne problems before until less than a year ago, when I got off the pill. I know and am sure that most of it is due to hormonal readjustment in my body, but in the meantime, I need to find the right type of products to lessen the symptoms on my face. It's made me really self-conscious...Do you have any recommendations for face products that are natural? I just bought the KMF gel and castor oil. Can you explain how you use the two together? After shampooing and conditioning, do you apply a leave in, then apply castor oil all over, then apply the KMF gel in sections? I'm trying to decide how to use castor oil with KMF gel. I could also mix it together and then apply to hair. What do you do? Hi Sara! I keep saying I'm going to do a post on what I did to clear up my skin. I really will this week. The first thing I did, after hesitating for almost a year, was visit a dermatologist. I had cysts under my skin and an active infection that I could not get on top of. I ended up on antibiotics byt he time I dragged myself in, and since then I have been taking steps so that I don't return to that horrible state. My acne is also hormonal- caused by PCOS- which will be part of my post. I re-set my skin and no longer use soap. I "wash" my face once a day with castor oil, mixed with Rosemary and Tea Tree oil and I also switched makeup and a few habits so that I am "leaving it alone" more often. My skin is super sensitive and does not appreciate any harsh treatment. I pre-mix the gel and castor oil together in my hand in small batches as I go. It makes a semi opaque serum when you mix it well. That mixture seems to behave very different than the gel alone or the castor oil alone. I'll make a follow up video on just how I mix and apply it. This combo has changed my life! I love it!! I even shouted you out on YouTube! Thx so much! Thank you very much for the long post your did on your skin vs. your hair. I just ordered this because of you! LOL, thank you for aiding in my PJ'ism. You are my hero!!!!! This combo worked SO WELL on my hair, I truly could not believe it. I'm indebted to you for finding a Holy Grail solution, which, as I am sure many curlies can attest, is a journey in trial--- and a lot of error. 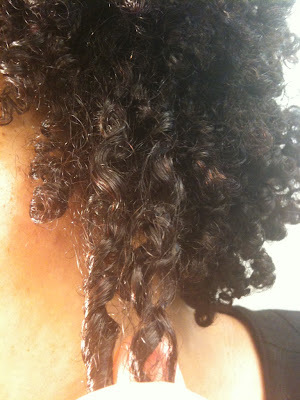 My hair is very much like yours - 3b/4a, highly sensitive to humidity, with multiple curl patterns. I've tried expensive stuff and inexpensive stuff but never have I found something that could hold my curl pattern so well without all the stiffness and flakes. Fantastic!@!!! Love ur hair. And ur Blog. So u use this without a leave in? My hair loves castor oil. And the gel on it's own don't work for me either. So i like to try this out.